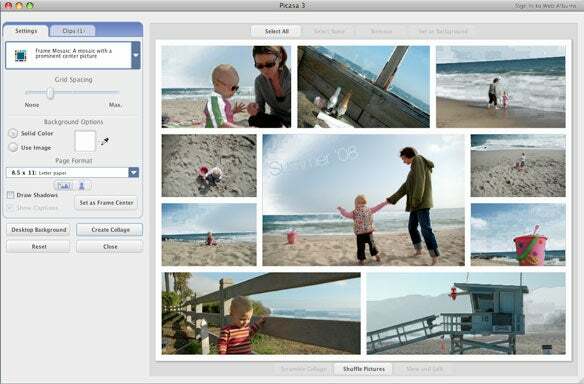 The free Picasa software is designed to help you organize your photos, regardless of where they reside on your computer. It imports (without moving or copying) photos from your iPhoto library and other folders on your Mac, including external hard drives if so desired (it's designed not to affect your iPhoto library, duplicating files as needed). It also includes many editing tools, such as those for straightening, text generation, create collages, and removing red eye, as well as Photoshop-like effects and adjustments. "We want to make it very easy for people to make their photos look better," said Jason Cook, product marketing manager for Picasa, in a phone briefing with Macworld. Picasa includes a collage feature that lets you combine multiple images into one. 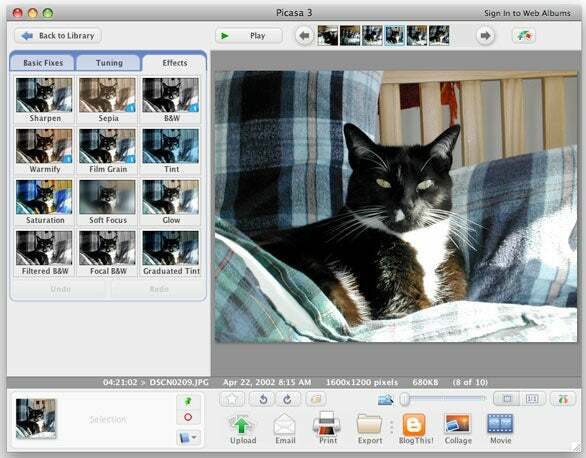 Picasa for Mac also integrates with Google's Picasa Web Albums online photo-sharing service, which Mac users have had access to previously using Google's iPhoto plug-in or the standalone uploader application. Using Picasa, you can keep local and online photos in sync and share photos easily with those in a Gmail address book. (Picasa Web Albums provides 1GB of free online storage, and you upgrade to more space, starting at $20 a year for 10GB, to share between a Gmail and Picasa Web Albums account). "There are millions of Mac users using Picasa Web Albums," said Cook. "This makes their experience a whole lot better." The Effects tab offers several Photoshop-like tweaks for your photos. Picasa includes many other features, such as a slideshow movie maker with one-click YouTube uploading, and the ability to post to Blogger pages. For the initial beta, Google says it focused on matching the speed and most of the core features of the Windows version, and will refine the interface and improve the feature set in the future. Currently, the Mac beta lacks geotagging features and the ability to order prints from online services. Picasa for Mac will be demoed at Google's booth at Macworld Expo this week.